Quite a number of people take garage doors for granted. When it’s opening, closing and looking great, most homeowners do very little to maintain their garage door, until one day it suddenly stops working as it should. There’re plenty of things that can go wrong on a garage door; from frustrating ones such as the door refusing to open to dangerous ones such as a loose or faulty door spring. Over 30,000 garage door related injuries are reported every year, and a majority of these injuries are a result of lack of proper maintenance. For this reason, we have outlined in this article the three most important maintenance tips for your garage door to make sure that everything is running smooth and safe. As we proceed, please take note that it’s always important to involve a professional when your door has major defects that may require inspection and testing. This is probably the most important preventative maintenance and garage door repair, but most people neglect it. As you already know, garage doors have plenty of moving parts made of metal. When in use these parts move and rub against each other, and that’s not always a smooth sail. It’s because of this, making a routine commitment of oiling and greasing your garage door can often add a few more years of efficient operation. While failure to lubricate your garage door regularly will lead to reduced spring life and an overworked garage door opener due to excessive drag/operational friction. It is this drag that often produces a grinding metal sound and is not only terrible for all garage door parts but can eventually lead to failure of your garage door system as a whole. Lubricating your garage door only takes about 10-15 minutes. 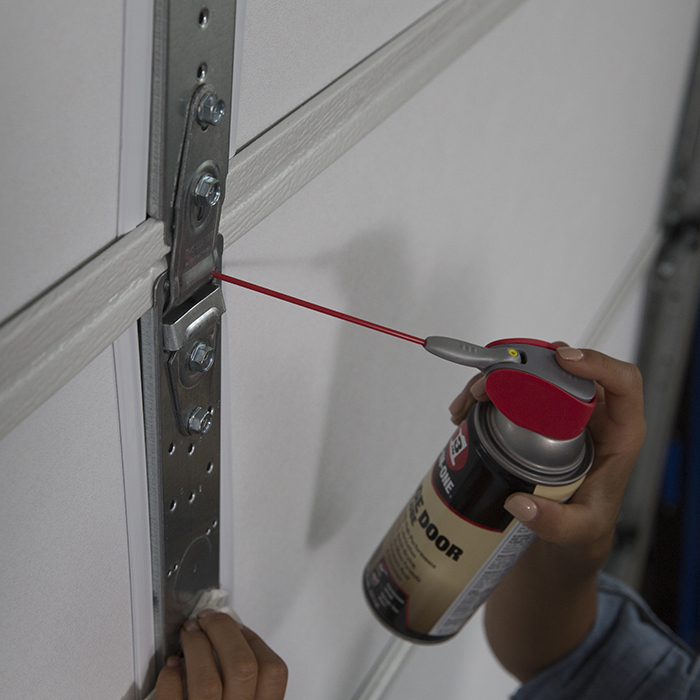 Use a garage door lubricant to revitalize your door openers’ screw or chain, and the rollers. Additionally, spray a light coat of the lubricant on the overhead springs. These will reduce both the friction and the rust to help prevent future maintenance issues. For best results, do this at least twice a year. Regular lubrication means a safer and happier home. Unlevel garage door tracks mean your door will not run smoothly. When the door tries to move up and down on the misaligned tracks, it will be required to work harder than it was designed to work. Over a period of time, the door may break down, fall off the track and become extremely inefficient during operation. The first thing you want to do is close your garage door while inside the garage and set up a ladder to inspect the tracks and rollers. Unlevel garage door tracks can be caused by the buildup of dirt and grease or worn out rollers. If the rollers are worn out, you need to replace them. You can also clear off the debris and any form of obstruction on the tracks that might be causing misalignment, this will help. Inspect the bolts and nuts that hold the tracks brackets in place then tighten any loose parts and replace any rusted bolts or nuts. Additionally, check the horizontal tacks alignment using a level. For efficient operation, the tracks need to slant slightly upwards towards the back wall of the garage. You should also check to see that both tracks are hanging the same distance from the ceiling. You can make any necessary adjustments by loosening the track mounting bracket bolts, tapping the track carefully into position and then tighten the bolts. To correct vertical misalignment, use the level to check for plumb. If you need to make any adjustments, loosen the mounting bolts and tap the track slightly using a wood block. Check again for plumb and tighten the bolts once the track is in the correct position. Again, most garage door off track situations can be quite dangerous to correct considering the bottom rollers are always under tension. You also don’t want to risk the garage door accidentally snapping off from its secured position during repair and landing on you or anyone else. The most common cause of loose garage door tension is frayed cables/belts that increase in length as they fray. A garage door may also rise on one side especially when the cable isn’t well seated on the cable drum. Doors with loose springs will often fall slightly when raised halfway due to insufficient tension on the cables or springs. Conversely, if the door’s spring is under too much tension it will slightly rise back when lowered halfway open. To tighten and balance a tension spring door, you need to adjust the tension on the door springs. But first, you need to take off all the tension on the spring. This can be done by opening the door all the way up and then propping it using a ladder. Place the clamp on the door track on both sides to hold the door in place. Next, Slip the spring off the door brackets and move it to the next hole/slot away from the hanger. Do this on both sides, remove the clamps to let the door rest on the ladder, and then test the door by moving it up and down. After testing the door, you can decide to adjust the springs further or simply do some fine tuning. To adjust the Torsion Spring door, you also need to disconnect the door and test its balance. To adjust the torsion spring, you need to first bring the door all the way down and secure it in place using c-clamps just above the rollers. Equipped with an open-ended wrench and winding bars, climb the ladder to access the spring you’re trying to adjust. Push one winding bar into the vertical hole on the door’s adjustment collar. This helps you hold the spring safely in place while you remove the screws. Loosen the screws using the wrench and wind the bar up about 90 degrees to the garage door. Place the second bar in the now vertical hole, hold everything in place and tighten the screws back in place. Remove the two winding bars and repeat the procedure on the other torsion spring, then release the c-clamps to test the door. It should, however, be noted that the process of adjusting garage door springs can be extremely dangerous especially if you don’t have the right tools and skills. If you notice that your door is losing balance, consider calling a professional garage door repair service to avoid injuries and ensure quality work. Some parts such as the garage door opener can be quite sophisticated on some door models and trying to repair them without the necessary skills and tools can make the damage worse. Relatively easier tasks such as lubricating and clearing debris from the tracks can be performed by the homeowner, however, risky maintenance tasks that involve the Garage Door Springs and openers should be left to garage door repair professionals.